Yes, it is possible to fall in love with a bag and don’t we know it. “It’s the one!”, we coo, whilst admiring it in the magazine or on the computer screen, and then, in the mirror we are mouthing ‘until death do us part’. But it’s easy to forget that little thing called practicality. The fashion for cross-body bags is a little ray of sunshine, offering us hands-free accessorising and removing teetering handbags from our shoulders. So, you own what you thought would be the bag of your dreams but given the chance; there is just that one thing you would change. How perfect would it be to bespoke a design to your needs? Read on to see this in action. A stunning animated cross-body bag from Anya Hindmarch arrived with the brief to adapt the strap. The existing strap was made from a woven cotton, leather and gold hardware – a luggage style strap that has become increasingly popular in contemporary bag designs. Our client wanted something more classic, but with an element of playfulness in keeping with the style and with the flexibility to be lengthened. When we work on bespoke customisations it is important that we do our research. This includes discussing with our client their needs and what they envisage alongside the style of the designer so we don’t create a mishmash solution. The aim for this bag was to re-imagine and not completely redesign. To start, a range of proposals was presented to the client. The Head of Atelier researched bags from Anya Hindmarch collections to connect with other strap styles like the signature burgundy bucket bag. It inspired the decision to mirror the 3D circular detail on the front of the bag. The re-imagining process is similar to that of an interior designer or brand agency – when we are set a brief, we like to present more than one idea to the client, which means we can tailor their chosen design to perfection! We embarked on the choice of a thick strap in burgundy leather with red keepers (which are like belt loops) and Sam Browne closures as seen in the original Anya Hindmarch collections. The closures are also known as mushroom studs - when you see them you will know why! The second option was a slim, 2 cm version, again in burgundy leather, retaining the original ends in red leather. Of course, the client loved both designs so we combined the two to create the final product and used slightly darker red leather for the ends of the strap, to compliment the main body. The metal hardware and leather were sourced and the Head of Atelier, Thaís, performed tests to achieve the perfect strap thickness, stitching size and finish. The finalised design was ready to become a reality. 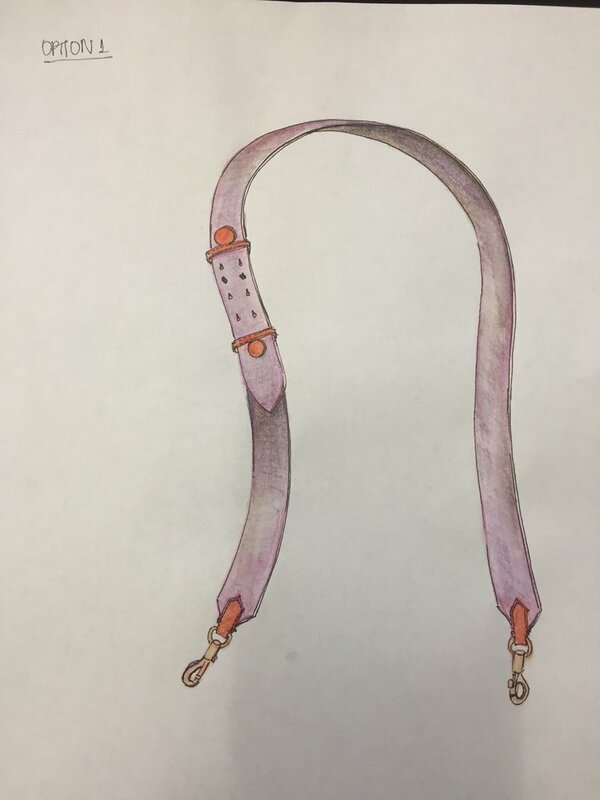 On presenting the finished strap to the client, she overjoyed, more so because when her friends saw it they couldn’t believe the strap was not an original Anya Hindmarch, but instead an original from The Restory. A true match indeed! Our re-imagining service enables you to breath new life into your accessories, whether it’s a small customisation or a full overhaul to create a new look. If you'd like more inspiration just have a look at our Case Study: Re-Colouring A Chanel 2.55.